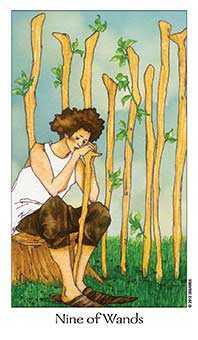 Find someone who can fill in for you and take time to refresh your energy. 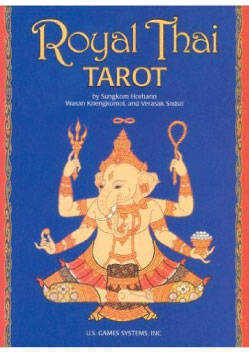 Royal Thai deck © U.S. Games Systems, Inc. 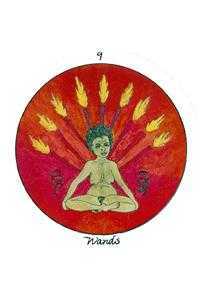 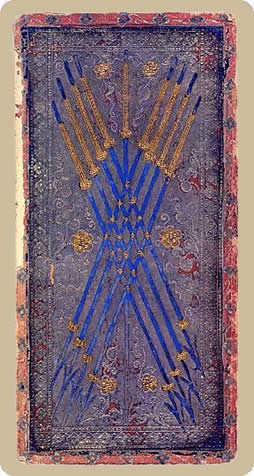 The Nine of this suit usually indicates a need for rest; some time out to mend wounds and savor victories. 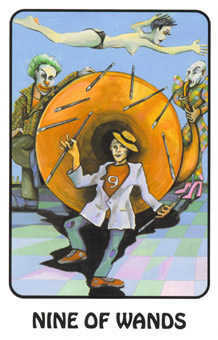 Although it may be hard to do, this card would have you leave the field to fresher teammates for now. 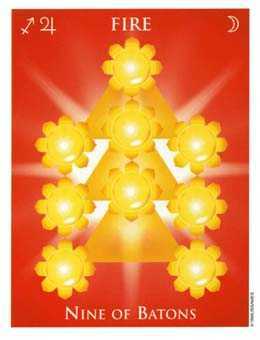 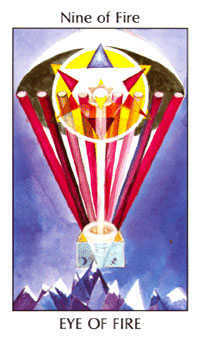 Release any attachment you may feel to being in a leadership role for now. 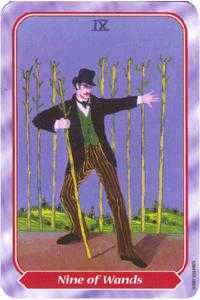 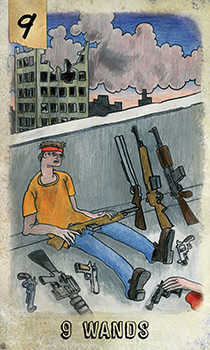 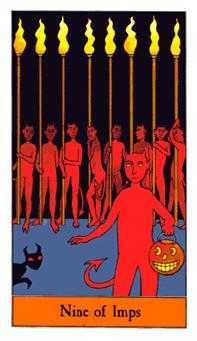 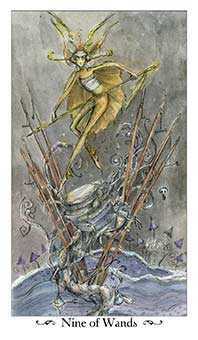 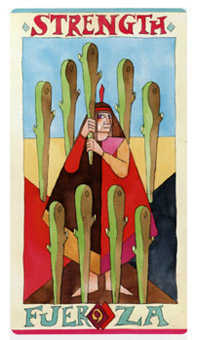 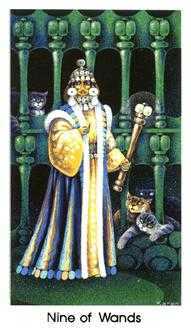 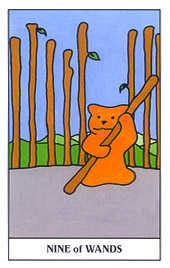 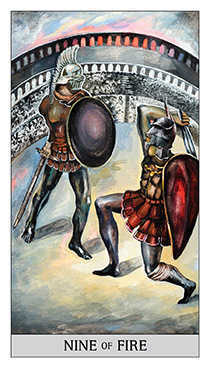 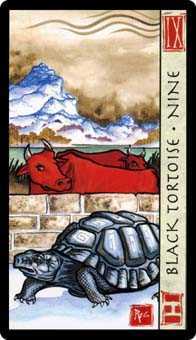 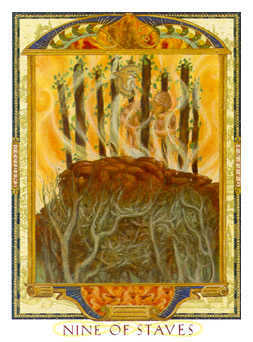 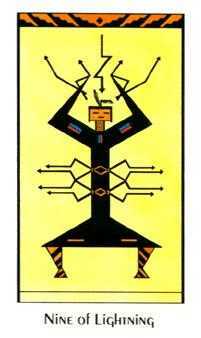 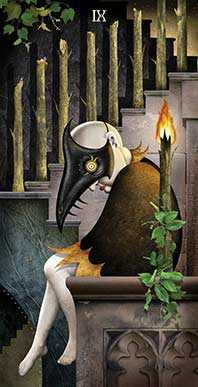 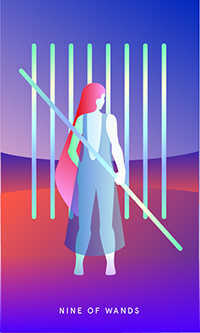 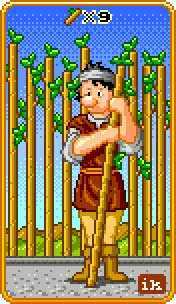 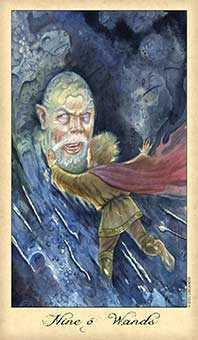 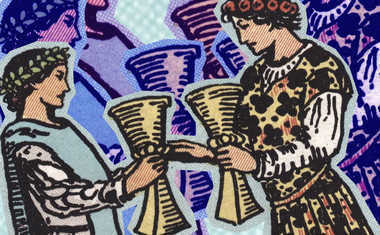 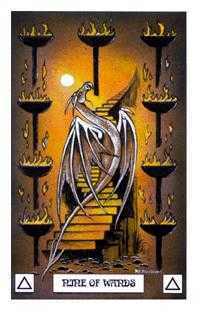 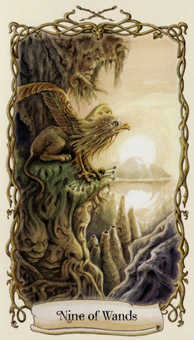 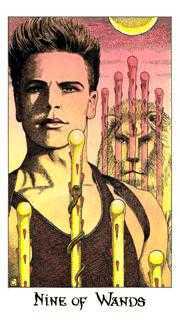 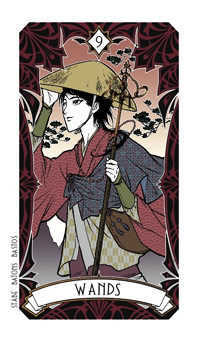 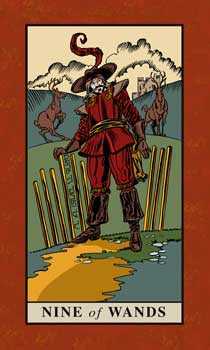 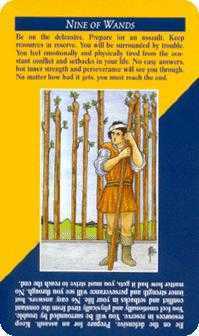 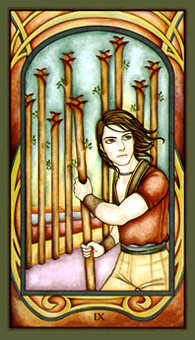 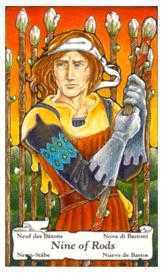 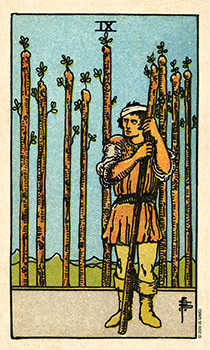 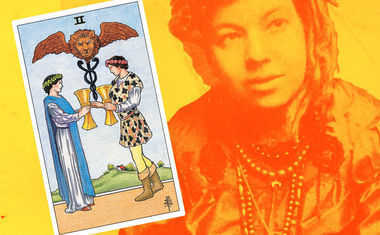 In the pictured Tarot decks, the protagonist is shown as too exhausted to be effective in defending his gains, yet resisting the suggestion to ask for help or step down. 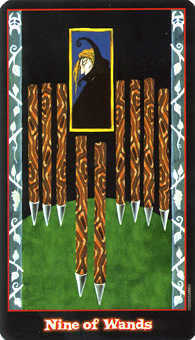 He or she hasn't had the chance to totally heal from past blows, and is still up there taking another beating. 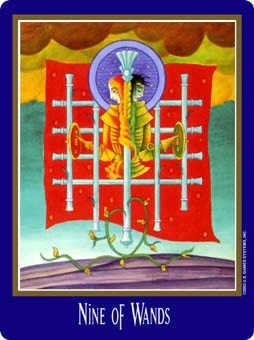 This is the fix that comes from making oneself irreplaceable. 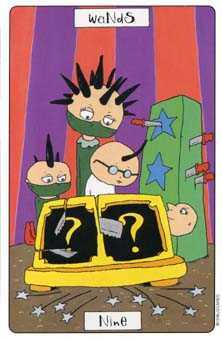 Fight off the maniacal thought that only you can save the day! 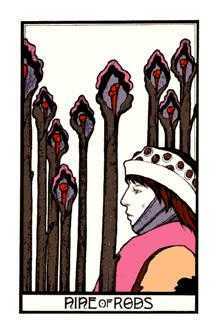 Stop rejecting loved ones who want to help you. 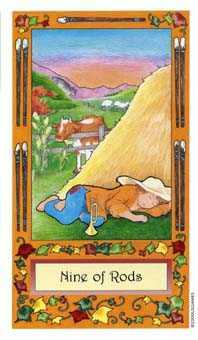 There is an important place for rest and recuperation in any endeavor. 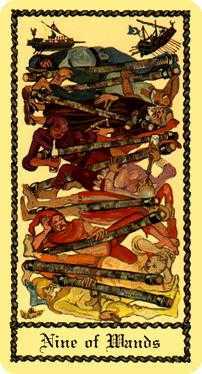 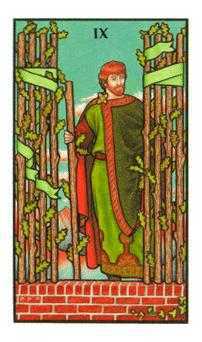 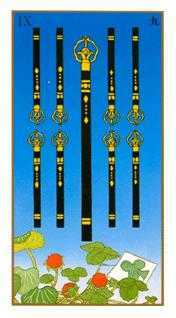 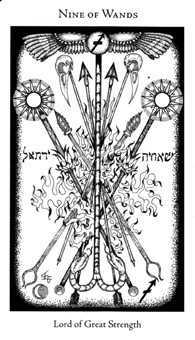 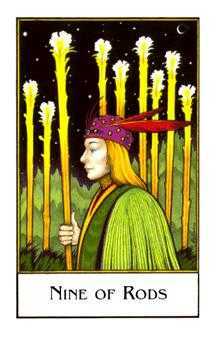 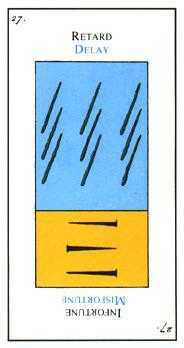 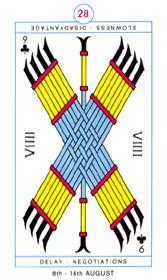 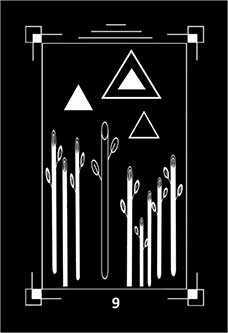 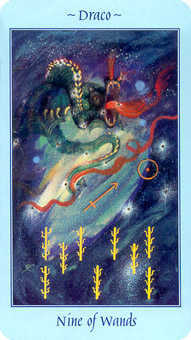 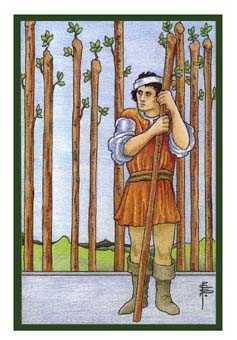 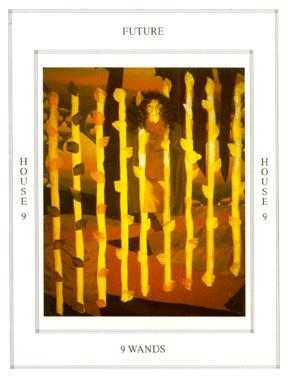 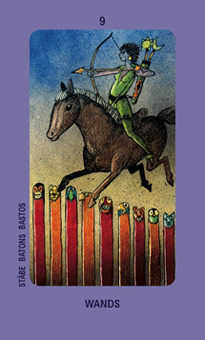 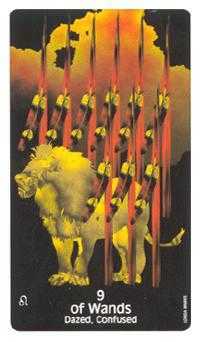 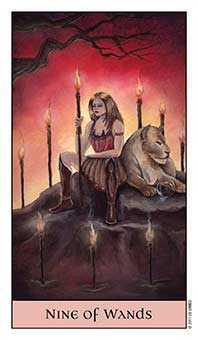 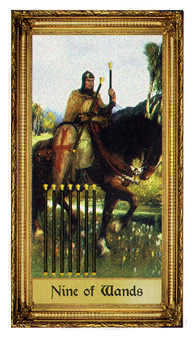 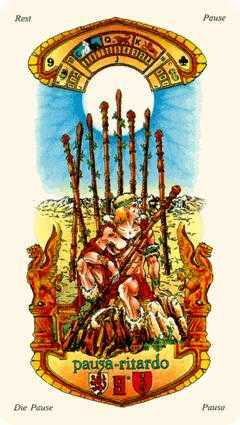 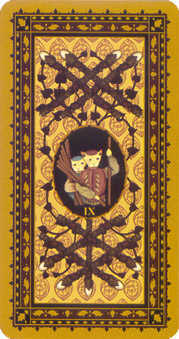 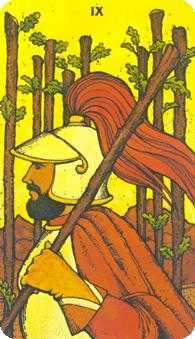 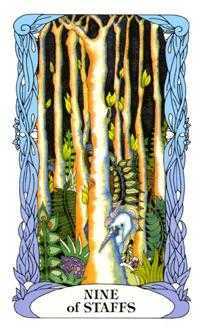 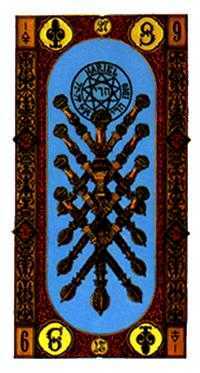 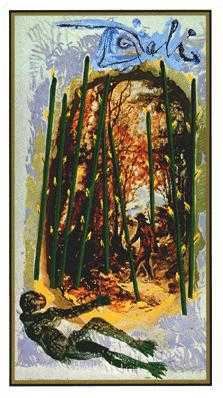 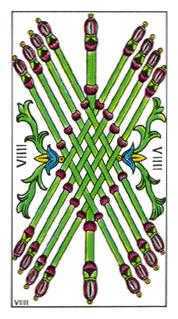 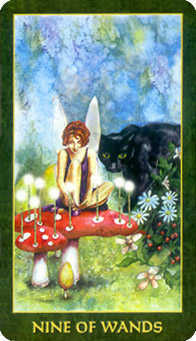 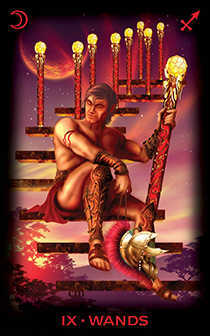 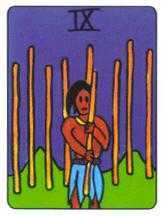 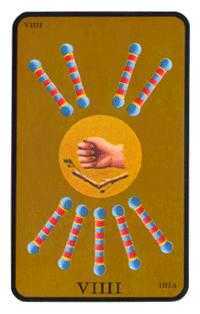 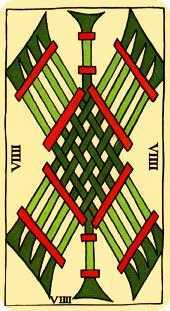 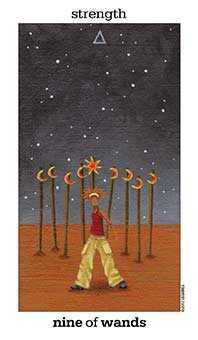 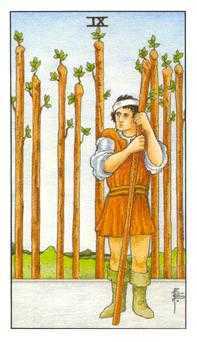 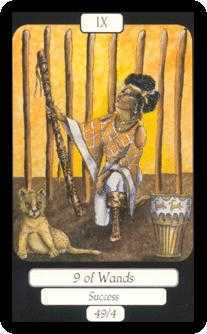 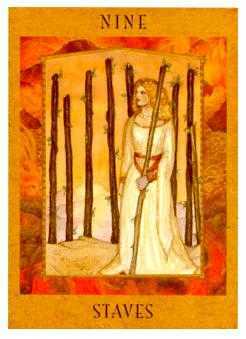 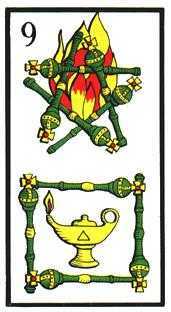 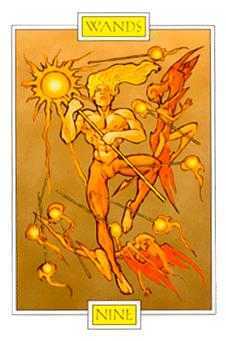 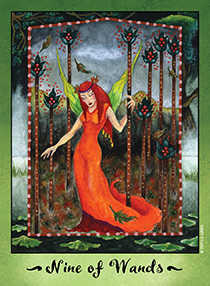 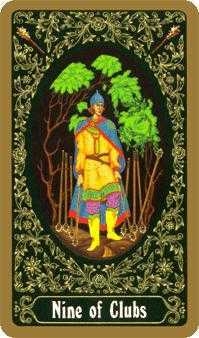 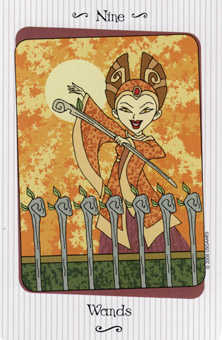 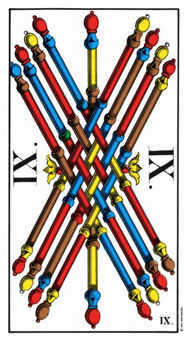 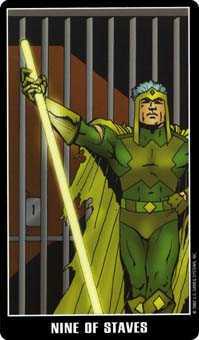 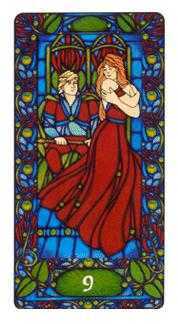 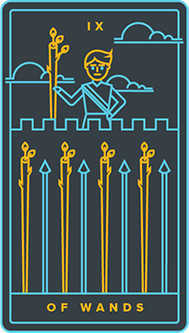 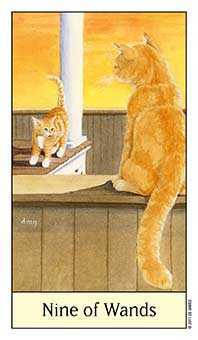 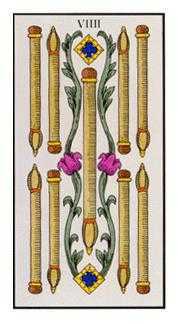 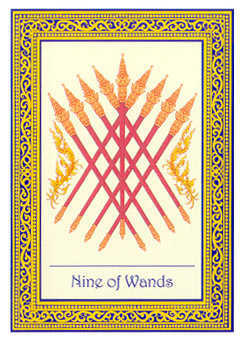 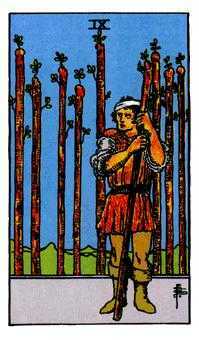 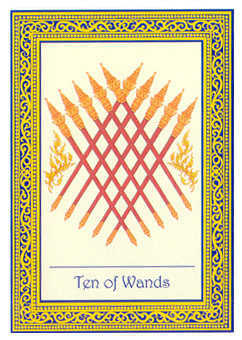 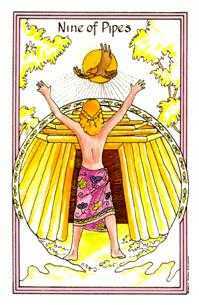 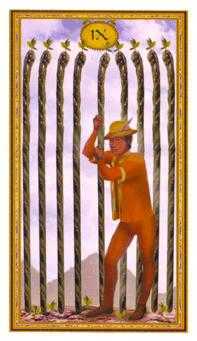 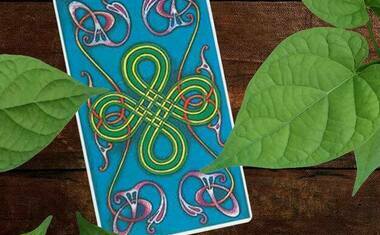 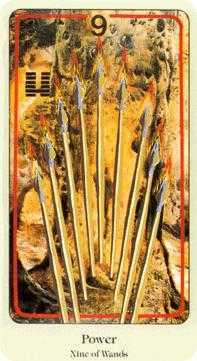 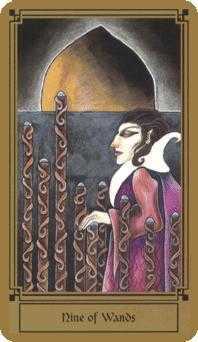 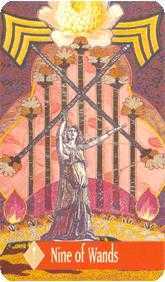 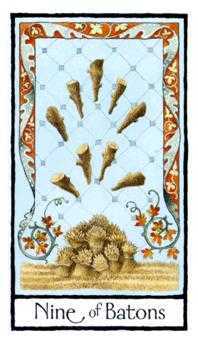 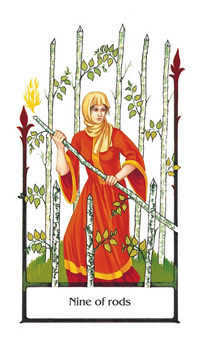 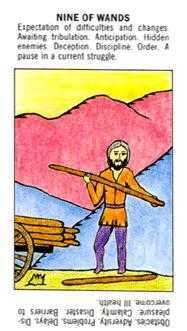 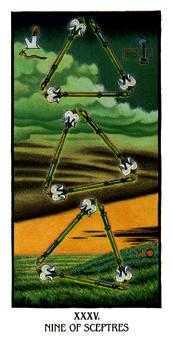 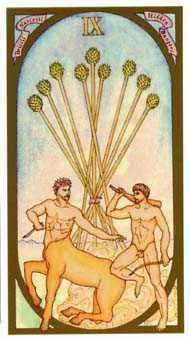 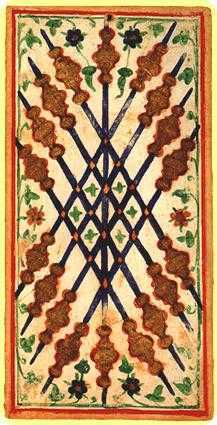 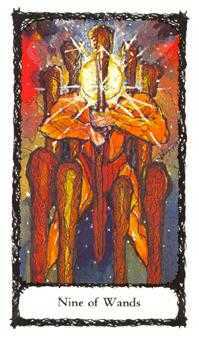 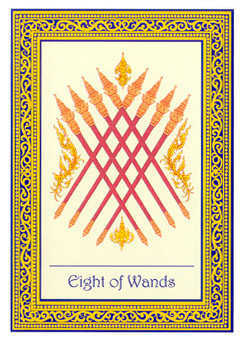 When the Nine of Wands is in this position, you have done everything you can to bring a situation to a successful conclusion. 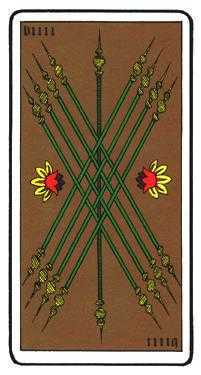 The full range of possibilities has been exhausted and all the creative energy that is available has already been put to use. 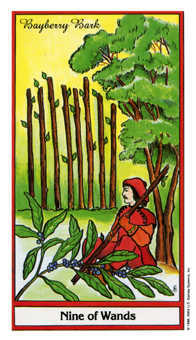 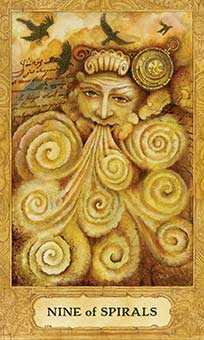 This may be a great time to lay down your concerns and enjoy a rest. 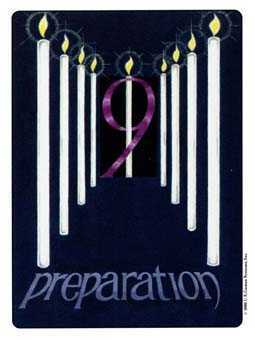 There is nothing more to bring to the mission unless you regenerate and restore the energy you have put into the cause. 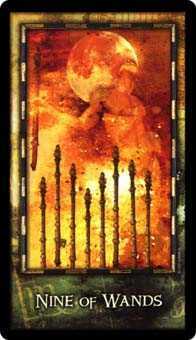 While it is praiseworthy to give all you have for something or someone that means a lot to you, masochism and martyrdom are ill advised. 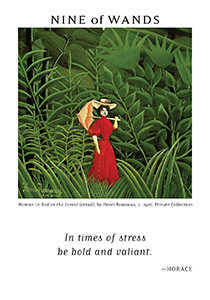 Take a break. 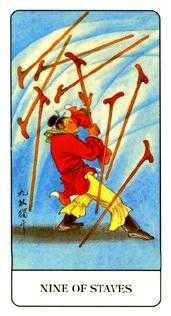 No one can fault you for it now.